YES!!! Especially if it is a Quinoa, Apple, and Almond Butter Breakfast Bowl! After I got my kids off to school this morning I started rummaging through the fridge and pantry looking for something for breakfast. I wanted something healthy and hearty to get me through my work out and beyond. I do smoothies for breakfast most days but the mornings have been getting chilly (even though it is supposed to be 80 degrees today) and I was in the mood for something warm. That’s when I remembered that a fellow blogger (Shira from in pursuit of more) just posted a recipe for a quinoa breakfast bowl and I had all of the ingredients to make it. Although you need a little time (20 minutes) for the quinoa and apple to cook, it was quick, simple, and easy to make. 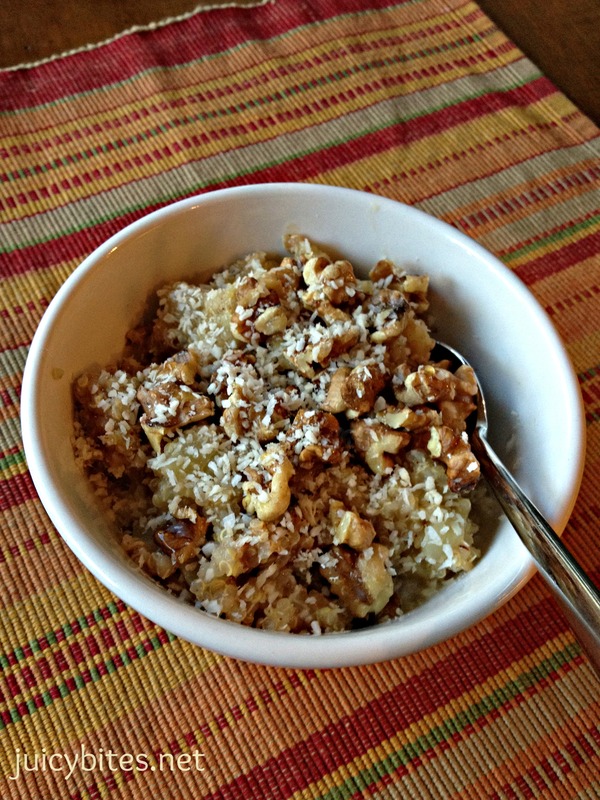 I love quinoa, but had never thought of eating it for breakfast. Let me tell you people…this was sooooo delicious!! You can find the full recipe along with more delicious details and beautiful photos here: Single Serve Quinoa, Apple, & Almond Butter Breakfast Bowl. Shira, I promise I’m not “blog Stalking” you, but I just couldn’t keep this one to myself! It is so simple, healthy, and satisfying. 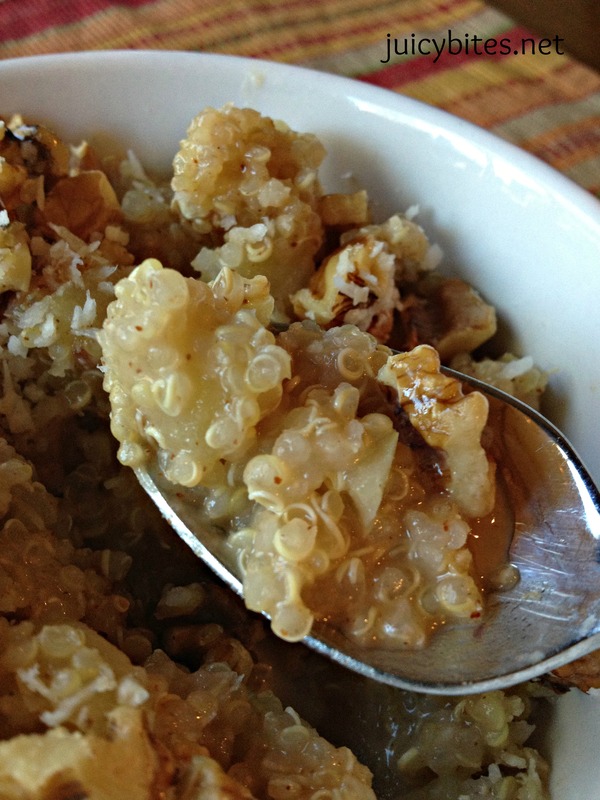 The chopped apple cooks with the quinoa and gets soft & sweet. The coconut butter and almond butter add a yummy richness and maple syrup is the perfect sweet touch. Next to my Chia Seed Breakfast, this one is on the top of my list of healthy breakfasts. I pretty much followed the recipe exactly. You mix some uncooked quinoa with 1 peeled and chopped apple (I used a lovely organic fuji) and some water and cook until the quinoa & apple is tender (20 minutes). Then you mix in a spoonful of almond butter, a little coconut butter (not necessary, but delicious!) and a little maple syrup. I also added a dash of cinnamon to the apple/quinoa/water mix in the pot before cooking. 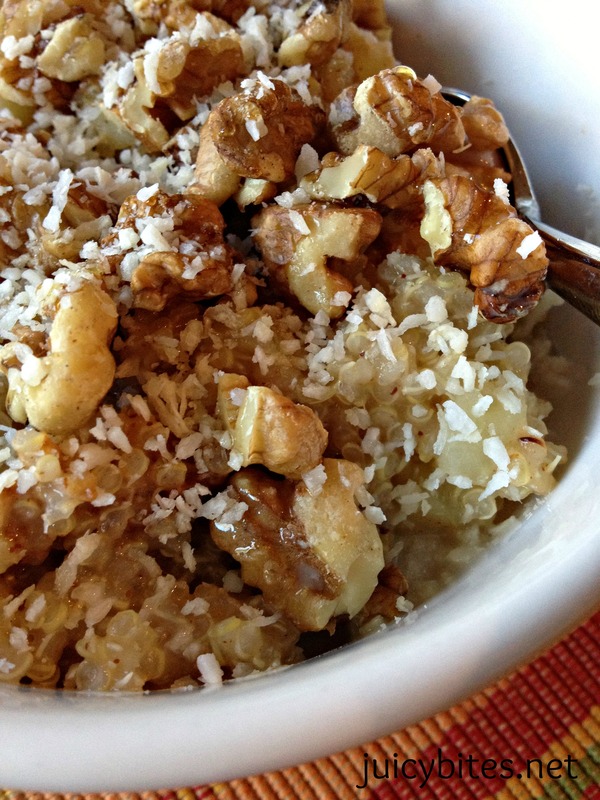 I topped mine with toasted walnuts and some unsweetened coconut. This was such a satisfying breakfast, I felt like I could have run a marathon after eating it! Ok…maybe not quite a marathon, but at least my usual 3 miles. Since I am food obsessed, I am constantly reading food blogs and cooking magazines, and watching food network. I see so many things that look good and that I want to try, but then quickly forget about them when I go about my busy day. I am so glad I didn’t let this one get away! It may seem like a small, simple, and basic meal…but it made me oh so happy.